Home » » Two Nigerian Yahoo-Boys, Chinese Woman And 16 Others Arrested in Malaysia Over Fraud. 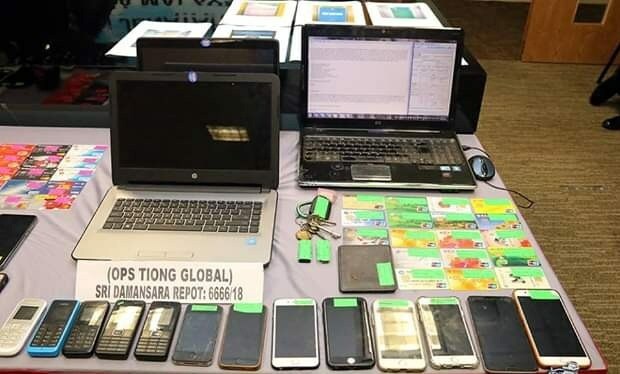 Two Nigerian Yahoo-Boys, Chinese Woman And 16 Others Arrested in Malaysia Over Fraud. Nineteen people including two Nigerians, believed to have cheated people in Singapore, Malaysia and Hong Kong of more than S$19 million through Internet love scams have been arrested. Law enforcement units from the three countries embarked on a joint operation in Malaysia from Oct 19 to 21 and nabbed 15 Malaysian women and a Malaysian man, two Nigerian men and a woman from China, police said on Monday October 22. The suspects, aged between 29 and 60, are believed to be involved in at least 146 cases of Internet love scams. In Singapore, two Malaysian women aged 40 and 48 are assisting with investigations as they are believed to have helped transfer criminal proceeds linked to the scams. Several mobile phones, laptops and ATM cards were also seized in the operation. Eight Internet love scam cases reported in Singapore, involving at least S$450,000, have been solved as a result of the joint operation. Police said that officers from the Singapore Police Force, the Royal Malaysia Police and the Hong Kong Police Force have been sharing information on Internet love scams since early 2018. Director of the Commercial Affairs Department of Singapore’s police force, David Chew, thanked his counterparts from Malaysia and Hong Kong for their “strong support” in fighting transboundary online crime. “The fact that victims in Malaysia, Hong Kong and Singapore fell prey to the same scammers shows that the criminal networks behind the scams are sophisticated and transnational. To tackle these syndicates, international cooperation among law enforcement agencies is extremely critical.” he added.